In order for the Indeni User to monitor a Juniper SRX properly, two steps must be completed on the SRX. STEP 1: Enable SSH for Scripting Access. STEP 2: Create a Locally Authenticated Indeni User with Administrator Rights. PLEASE NOTE: If access to the SRX is firewalled, SSH must be allowed from the Indeni server via the firewall. 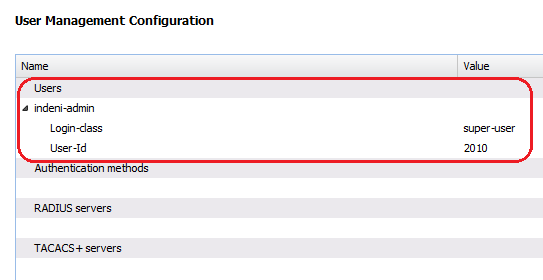 Select commit from Actions pull down menu to activate the configuration. A locally authenticated User account with administrative privileges is required for Indeni to access SRX devices. Please note that the “root” account cannot be used for this purpose. Click Add button to add a new account. Ensure that the “Login class” is “super-user”. We currently do not have FAQ’s generated around this device at this time. If you have questions, or suggestions for FAQ’s, please join us on our Community and ask there. Your feedback is greatly appreciated!